Hello! Happy Thursday! 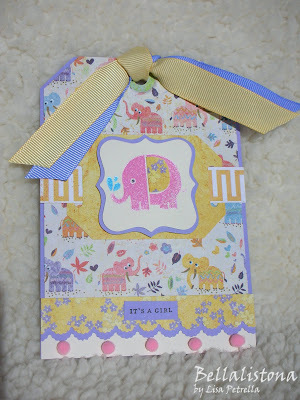 Here's a card that I made for my sweet friend, Danielle, who just had an adorable baby girl!!! I don't know if you can tell from the photo, but I used pearlescent inks on the elephant image to give it some sparkle. I paper pieced the elephant's ear with a scrap of patterned paper---I think it makes her look more cuddly! The mini pink pom-poms at the bottom are leftovers from a craft project I did with my students a couple of years ago. Gosh, I just love finding a good use for leftover materials like that!! Well, I'm off for a wintery hike with my husband!! The snow-covered trees and mountains look absolutely stunning against the crystal clear blue sky here today!! Can't wait to get outside and ENJOY it!!! Hope you're doing something fun today as well!! Finished Card Size: 3.75" x 5.5"